Havildar Udham Singh was born on 16th March 1959 in Chaihadi village near Ghumarwin in Himachal Pradesh. 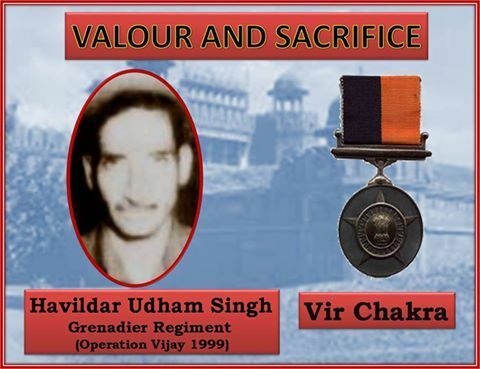 On 14th June 1999, Havildar Udham Singh was volunteered to lead the attack with his section in the area of Hump in the Drass sector during “Operation Vijay”. He set along with his section and kept on neutralizing enemy’s resistance en-route. But Udham Singh section’s advance was delayed due to the heavy automatic fire of the enemy. Havildar Udham Singh noticed this and immediately ordered his troops to keep engaging on the enemy position. With a small team he crawled towards the enemy position from the flank and halted his team close to enemy sangar and he himself inched closer to the lob a hand grenade inside. The enemy troops had noticed his movements and fired at him incessantly caused severe injuries to him. But he had not cared about his wounds and rushed up to the enemy sangar and lobbed a hand grenade and fired from his personal weapon calmly from close range of the three occupants and then called his men to charge ahead. He finished the task of capture of Point 5140, the important tactical feature Hump. 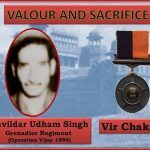 On 13th/14th June 1999, Havildar Udham Singh volunteered to lead the company attack with his section on area Hump in the Drass sector during “Operation Vijay”. He, with his section, kept on neutralizing enemy’s resistance en route. The section’s advance was impeded due to heavy automatic fire of the enemy. Seeing this, Havildar Udham Singh reacted immediately ordering his troops to keep engaging the enemy position, he with a small team crawled towards the enemy position from the flank. He halted his team close to enemy sangar and himself inched closer to lob a hand grenade inside. His movement was however noticed by the enemy who fired incessantly causing severe injuries to him. 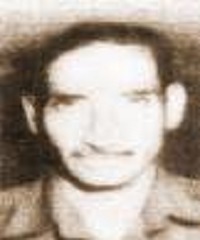 Without caring for his wounds, he rushed up to the enemy sangar and lobbed a hand grenade and fired from his personal weapon from close range lulling three occupants and called his men to charge ahead. In the process, he succumbed to his injuries but not before paving way for the capture of the important tactical feature Hump,which later facilitated capture of Point 5140. Havildar Udham Singh displayed exceptional bravery and courage before making the supreme sacrifice for the nation in the highest traditions of the Indian Army.